The Mitchells: Five for Victory. Daddy has just gone off to World War II. One of his final words to his daughter Joan is, "No dogs!" She would dearly love such a pet, but life is full and so many new friends-pets as well as people-she hardly has time to think about dogs. Humorous and tender incidents combine with delightful illustrations to make the Mitchells truly unforgettable. Copyright 1945 / 1995. Softcover. 5.5 x 8.5 inches. 236 pp. Comments on this book by Dr. Mary Kay Clark: This is a story told by one of five children in the Mitchell family, taking place during World War II, when the father of the family is called to serve in the Navy. Although the family is Catholic, it is so little mentioned, that no one would recognize it is a Catholic family. Christmas is simply exchanging gifts. A baptism is a time to talk about the baptism gowns for the twins. Nevertheless, it is an excellent book for portraying family life before television and computers. 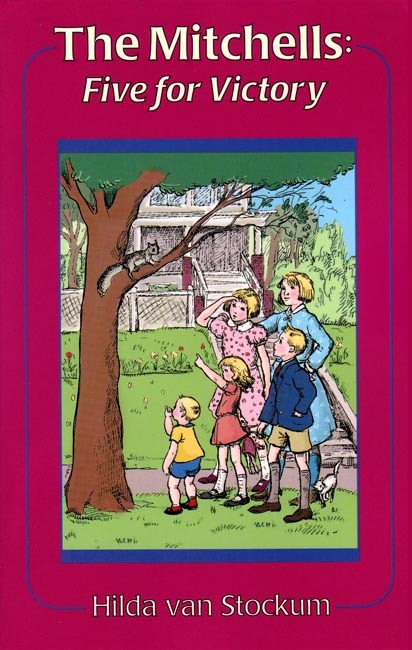 It is a picture of brothers and sisters being best friends and playing together, thinking up adventures together, having fun with themselves and the squirrel and the bunny and the older-lady neighbor, and the orphan girl living next door. It shows how kids once dreamed up and acted out their own adventures, never relying on soccer teams or being driven anyplace at all. Because the father has gone to war, there is an emphasis on sacrifice and living on very little money, and being forced to rent out a room, and knowing that Hitler is the enemy. A light-hearted book yet a story with heart. I read this book (actually the whole series [3 books]) after I read "The Borrowed House" by Hilda van Stockum. At first this series looked to me to be too young, since it was recommended for 5th grade, but let me tell you, don't make that mistake!!!! The way van Stockum writes compels you to read it, and the plots are good too. This first book in the series is great. Fantastic. Hilarious. An awesome book for families to read together, or just a happy read for one kid (ages recommended ranging from 2nd grade to 8th grade!). Joan Mitchell, aged 10, is the oldest child in her family of lively kids. Most of the story is written from her point of view, and there are lots of entertaining events. Examples: exploring the yard in a house nicknamed the White Elephant, meeting the little refugee who lives there, having a growing menagerie in the house, etc. Bottom line: read the whole series! Enjoy!